Seen here is a photograph of an ancient mosaic masterpiece, a gift of Tunisia to the United Nations. The 1700-year-old work, depicting the cycle of the year, was discovered in the winter of 1939-1940 at Haidra, Tunisia. 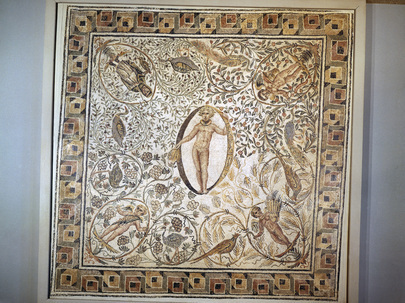 The mosaic is a square floor, now displayed as a mural, measuring 11 x 11 feet. It has been mounted on a wall just inside the entrance to the Delegate's North Lounge at UN Headquarters.